Extraordinarily effective, yet gentle, this work-smarter StriVectin® Advanced Retinol Eye Cream fights what ages you, dehydration, fine lines, crow's feet, uneven texture and lack of firmness, offering the unsurpassed performance of Retinol without irritation. 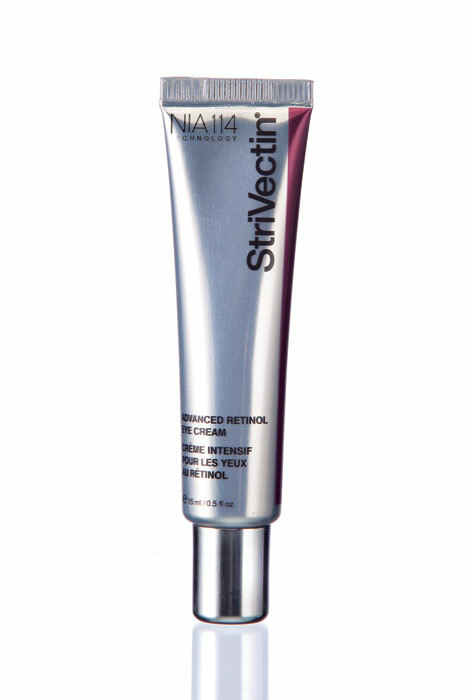 The secret lies in StriVectin's patented NIA-114® molecule, a scientific breakthrough discovered in skin cancer research and proven to intensify Retinol's potency without irritation, peeling, redness or sensitivity. One of the most active forms of Niacin, NIA-114 has extraordinary ability to absorb into the skin's surface, reducing Retinol sensitivity. This powerful team works harder, faster and smarter without irritating side effects, boosting skin's natural cellular regeneration to fight the look of wrinkles, visibly firm eye area, minimize dark circles, puffiness and redness, hydrate, smooth and brighten skin. Use AM and PM for dramatic results! .5 fl. oz. For external use only. Keep out of the reach of children. This is an eye product if product gets into eyes, flush well with water. Discontinue use if signs of irritation or rash appear. If irritation persists, consult a doctor. This product contains Retinol that may increase your skin's sensitivity to the sun. Use sunscreen daily. Who is it for? Sophisticated consumers concerned with fine, dehydration lines, crow’s feet, sagging eye area skin, dark circles, puffiness, redness and uneven texture. Consumers who are unable to use retinol due to irritation. The only negative thing I can say: it stings a little if it gets in your eyes. Positives - a little goes a long way. My undereye circles are almost gone and my eyelids are firmer. I am currently using this product & like it. I will continue to use it. because I hope it does as advertised. Trust StriVectin. My eyes are looking tired! Not at this time...1st time to try this product. What is percentage of retinol? BEST ANSWER: Thank you for your question. The ingredients for this product are listed on the website, however, the manufacturer does not provide us with the percentage of retinol in this product. We hope this information will be of help to you.